In the left corner, measuring 8ft long and weighing in at 500 pounds we have Trevor the Crocodile. In the right corner, measuring 4 1/2 ft long and weighing in at 150 pounds we have Spotty the Leopard. 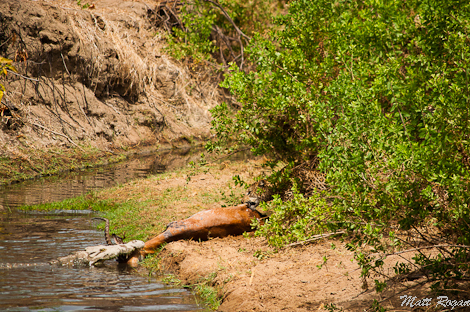 In the middle, measuring 3 ft long and weighing in at 130 pounds we have Swala "dead weight" the Impala. It was an epic battle that pitted the power house of an ancient dynasty against a smaller, quicker, more agile opponent. 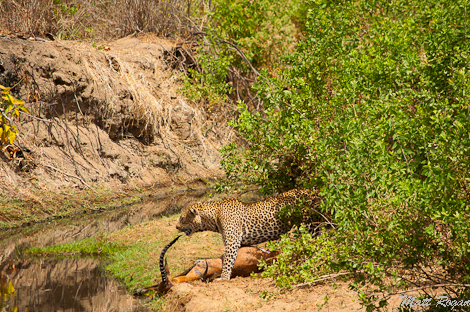 Neither could make much headway with the croc keeping his feet well planted while the leopard struggled valiantly to make any sort of progress. Soon, Lenny the leopard decided to try some different tactics. First came indifference as he pretended to care more about the spectators than the main event. Next he tried to intimidate his opponent into giving up. Finally, he decided that if you can't win, sometimes you just have to change the game. 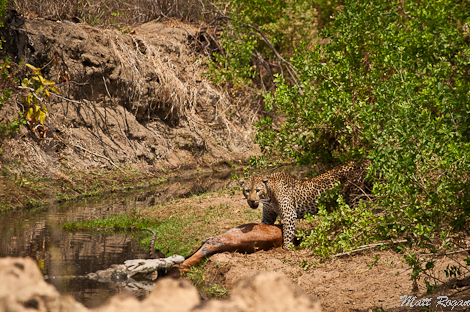 The leopard realized that he had the tasty end of the impala, so he just sat back and started eating. 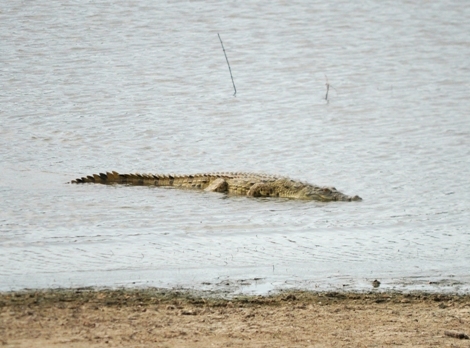 Eventually, the croc decided there was no reason to watch the leopard eat when he could be basking in the sun downstream. 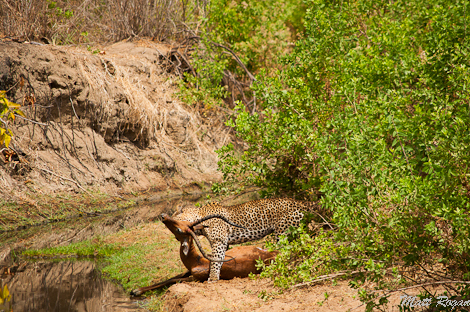 Flushed with victory, the leopard stood tall over his prize. 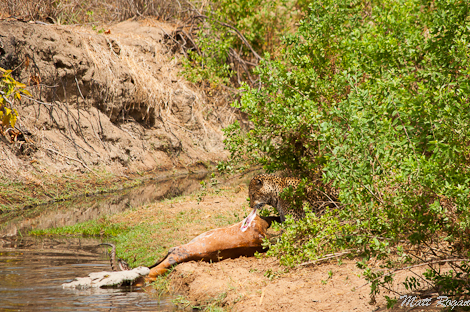 Eventually he picked the impala up, dragged it under a palm tree, and noisily devoured his meal. 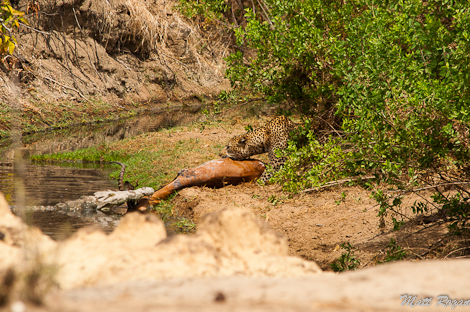 A couple weeks ago, Mark over at Chada Katavi wrote a blog about how peaceful the leopards are in Katavi national park. 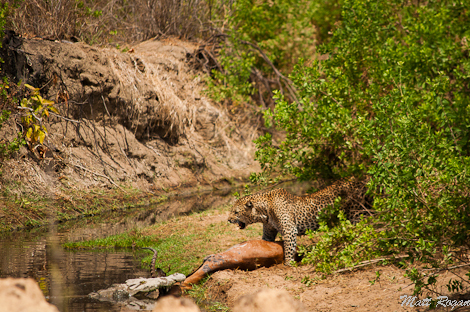 I guess they're just made a bit rougher and tougher here in the Selous.